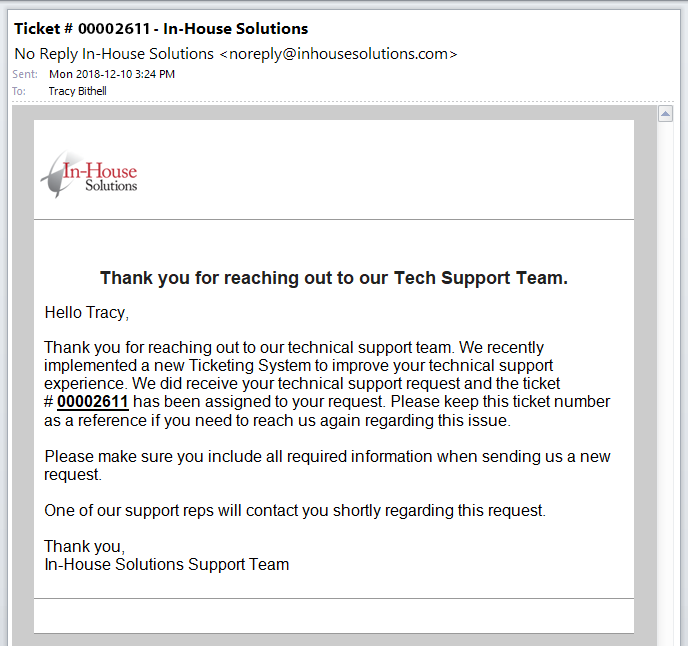 In-House Solutions has a new support ticketing system! A technician will be assigned your case and will assist you through your issue. We are still available by phone. When you call us, your issue will be logged and you will be assigned a ticket as we proceed to assist you. When you open a ticket through email you will receive an automatic reply that gives you a ticket number to reference. There is no need to reply or respond to this message. If you call in after you send an email, please reference the ticket number assigned to you. If you do not see the automatic reply it may be in your junk folder. If it is, you can tell your email system this is not junk and move the reply to the Inbox. The steps to do this can be found below. Enter [wlemail] and additional information if you wish. Click Add to contacts next to [wlemail] to finish. Click Add [wlemail] to contacts list to finish.